Perrier recently relaunched their website in a Tumblr format as District Perrier. One of our first assignments for this new vision was to talk to a local influencer about their favorite spots in their "district". We immediately thought of Alexander Mijares because his art is incredible, his social media following is astronomical, and his lifestyle is enviable. He is also a great ambassador for Miami thanks to his Cuban heritage and the incredible success he has seen in his young art career. 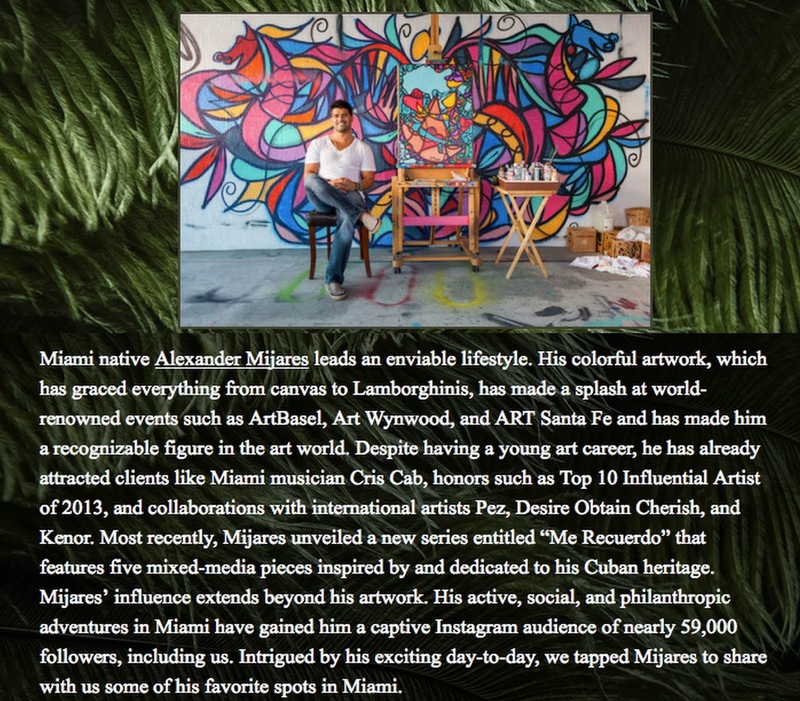 Read the excerpt below to learn why we love Mijares and click on the image for the list of his favorite eight Miami hangouts. If you're around this weekend, stop by the Taste of Cuba Festival at the Hialeah Park Casino (100 East 32nd Street, Hialeah) to check out Mijares' newest series "Me Recuerdo". He is the featured artist for this fabulous festival that showcases Cuban culture to South Florida through art, music, food and spirits. Have you heard of Alexander Mijares? What do you think about his work? Which of his 8 hangouts do you like most? Why? Leave a comment below or send us a tweet @ThankYouMiami!